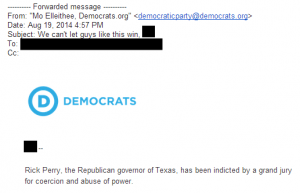 The Democratic Party’s War on Women rhetoric doesn’t seem to be working. The article doesn’t disappoint, either. Everything wrong with today’s Democratic party, in one picture. Somebody in the Democratic party approved this. Signs promising for an upcoming internal Democratic party revolt. Oh, boy, but this will be fun. In a sign of the left’s new aggressiveness, a coalition of liberals is trying to marginalize a centrist Democratic policy group that was responsible for a Wall Street Journal op-ed article this week that said economic populism was “disastrous” for the party. Please, Democrats: go ahead and embrace Obamacare. Targeting vulnerable Democratic Senators on gun control. Why the Democratic party is not taking the House back. Barack Obama. You can argue about whether Barack Obama is a drag on House races or not, but it’s largely academic anyway: Obama for America simply can’t make itself care about the downticket races when they’re in trouble. Which is why House races have dramatically shifted towards the GOP in the last month. If you’re a Democratic candidate in a swing state, you might have seen the President stop by and help you out. Might. If not… well? Good luck? Wave election fatigue. …We’ve had three wave elections in a row: two Democratic ones, and one Republican one that wiped out the first two. We’re pretty much out of low-hanging fruit. We’ll have some more in 2014 – it takes two to three terms for a Member of Congress to decide that he or she is invincible – but right now everybody’s mostly hunkered down and taking no changes. And… that’s how it is. With one important caveat: none of this would really matter if the Democrats happened to have, say, a six point advantage in the electorate this year. #rsrh I do not wish to declare DOOM in the national race yet. Yup. Somebody thought that this was a good idea. I hope to God that it runs in every swing state, including the ones with a lot of people wondering whether Obama is really as Presidential as they once thought. I also wouldn’t mind hearing whether or not the Sesame Corporation is happy with them being identified with the Democratic party at this point; after all, I have Christmas shopping to do. …the president, as others have noted, and his team have been going fairly small at a moment when Romney is consistent in a message and pivoting toward going bigger (the foreign policy speech, more emotion on the trail, and so forth). And this video is the kind of small ball that Boston smacked over for months. Charlotte Democratic convention’s appeal simply becoming more selective*. You know, RedState can afford a four-day event. THE CEREMONIAL ANOINTING OF THE ONE WILL STILL BE TAKING PLACE AT THE BANK OF AMERICA STADIUM. …leaving no-one in particular to challenge the Republicans. The Tuesday Weinergate Democratic screaming match. If you have ever wondered why the GOP leadership’s first instinct in time of scandal* is to immediately jettison the offenders (whether they like it or not)… well, there’s a reason for that: it rarely gets better if you let things fester. Case in point… Politico reports that a Democratic caucus Tuesday devolved into a bit of a screaming match; Rep. Bill Pascrell of New Jersey felt obligated to chastise Rep. Allyson Schwartz of Pennsylvania over the latter’s call for Weiner’s resignation. Pascrell has appointed himself as Weiner’s unofficial defender, which means that he apparently feels entitled to dictate to others (especially, well, female others) what is or is not an acceptable response to Weiner’s poor life choices.